This basic brownie recipe is for making brownies from scratch. 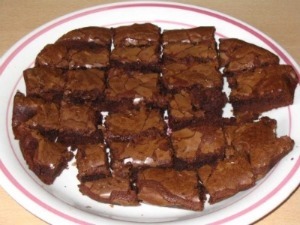 A chewy brownies recipe, it can be varied to make many different scrumptious brownies. Add 3/4 cup coarsely chopped pecans or walnuts to make nutty brownies. For a mocha flavor, add 2 tablespoons of instant coffee powder to the melted chocolate. Substitute 1 cup of firmly packed brown sugar for the granulated sugar for a hint of sweet molasses flavor. Vary with additional flavors by adding chocolate chips, white chocolate chips or peanut butter chips. With this basic brownie receipe and your imagination, you can make all your family’s favorites. 1. Preheat oven to 350 degrees F. Grease an 8-inch square brownie pan or baking pan . 2. Melt butter and chocolate in a small sauce pan over low heat or in the microwave (microwave in a microwave-safe bowl for 30 second intervals, stirring after each, until melted). Set aside to cool to room temperature. 4. In a large bowl, with mixer on medium speed, beat sugar, eggs and vanilla until light and fluffy. Slowly mix in chocolate mixture. Add flour mixture and mix well. Spoon batter into pan, spreading evenly. 5. Bake for 30 to 35 minutes until brownies just begin to pull from sides of pan. Remove from oven and cool in pan to room temperature. Cut into squares and serve.